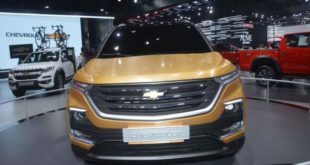 The upcoming 2020 Chevy Traverse is expected to hit the road with minimal changes in comparison to the outgoing, 2019 model. So, the 2020 version will most likely get several new exterior color shades while the design will stay the same. Inside the cabin, the new Chevy could get some changes considering equipment and perhaps some new packages depending on a trim level. Under the hood, it will be offered with the same 4-cylinder and V-6 unit while the hybrid or an EV version might arrive later. The 2020 Chevy Traverse will be offered with types of engines under the hood. So, the base is going to be a 2.0-liter inline-4 turbocharged engine. This one will be able to produce 255 horsepower and 295 pound-feet of torque. It will work with a 9-speed automatic transmission and will be available with front-wheel drive system only. This unit will be rated at 20 mpg in the city, 26 mpg on the highway, and 22 mpg combined. Furthermore, the second option is going to be a 3.6-liter V-6 unit. This powertrain will have the output of 310 horsepower and 266 lb-ft of torque. It will also be mated to a 9-speed automatic gearbox and will arrive with both front-wheel and all-wheel drive configurations. As for the fuel economy, the front-wheel drive model is estimated to be 18 mpg in the city, 27 mpg on the highway, and 21 mpg combined. Connected to all-wheel drive layout, it will get 17 mpg in the city, 25 mpg on the highway, and 20 mpg combined. On the other hand, the new Chevy might also get a 4-cylinder turbo-diesel engine. As well, some sources have also revealed that the 2020 Traverse could get a plug-in hybrid or an all-electric EV engine. However, for now, there is no any further information about the new engine options and those might happen for the 2021 model year. 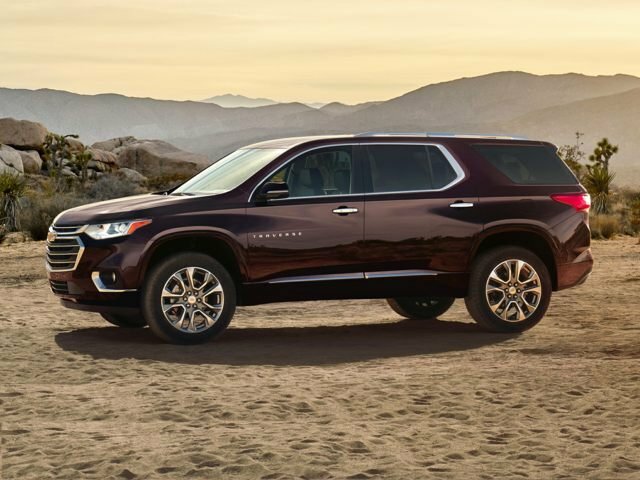 Design-wise, the 2020 Chevy Traverse will return with the same design as the outgoing model which looks modern and classy. The front end wears the same handsome and taller grille which is split by a crossbar in the middle of which there is the traditional Chevy logo. Moving to the rear end, there are slim taillights. The profile features boxy lines, body-color side mirror caps, and more chrome accents. 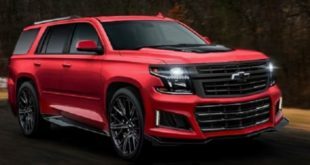 However, the 2020 Chevy Traverse might get a few new exterior colors as the only visual change. 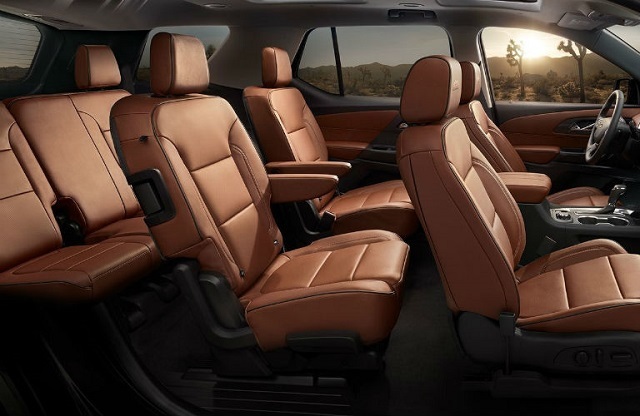 The 2020 Chevy Traverse is a spacious SUV which comes with three rows of seats. The front seats are highly comfortable even at all-day drives and most of the trim levels come with power adjustment for the driver’s seat. The top models will also offer lumbar and passenger adjustment and more quality materials. The second row is also very good and comes with captain’s chairs and provides great room for adults. Furthermore, the third row is good as well and can place adults. The doors swing wide so the entry and exit are easy. As for the cargo space, behind the third row, there is a room of 23 cubic feet. If you fold flat the third row, you get the room of more than 58 cubic feet. Moreover, with the second row folded down, the cargo room expands to 98 cubic feet. Most of the trim levels will get an active noise cancellation, so the cabin will be quiet and very pleasant to spend time in. The cloth upholstery is standard while the higher trims will get leather. On the center of the dash, there is a 7.0-inch touchscreen with the infotainment system. 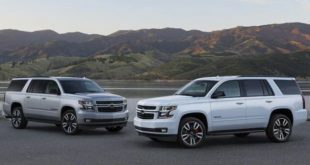 The standard equipment of the 2020 Chevy Traverse will include cloth seats, three-zone climate control, 18-inch wheels, power features, a 7.0-inch touchscreen for the infotainment system, keyless ignition, a traction mode selection, six USB ports, Apple CarPlay, and Android Auto connectivity. The LT model will add second-row captain’s chairs, power adjustable driver’s seat, better cloth seats, 18-inch wheels, and a leather-wrapped steering wheel. Heated front seats, rear parking sensors, blind-spot monitors, a power liftgate, and an 8.0-inch display will be optional. The Premier model will also include an 8.0-inch touchscreen, heated and cooled front seats, remote start, Bose audio system, wireless smartphone chargers, and heated second-row captain’s chairs. Furthermore, the High Country model will also get active lane control, standard all-wheel drive system, a panoramic sunroof, adaptive cruise control, automatic emergency braking, and power-folding third row. As for the safety, all the versions will come with airbags, traction, and stability control systems, and a rearview camera. 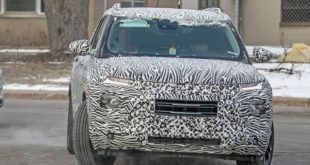 The new 2020 Chevy Traverse will most likely be launched sometime in the end of 2019. The price probably won’t be much different from the current model which starts at around $30,900 while the higher trims will be roughly $45,500.